The Christmas season brings many wonderful traditions, but the music of the season remains the highlight. And sharing this music with someone else can become a tradition of its own. 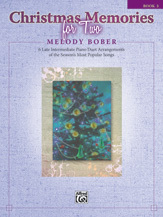 Melody Bober has arranged some of her favorite carols for one piano, four hands. Ranging from lush and romantic to fun and upbeat, there is something for everyone in this series. Included in this volume are Angels from the Realms of Glory; It Came Upon the Midnight Clear; Joy to the World; O Holy Night; Still, Still, Still; and Ukrainian Bell Carol.